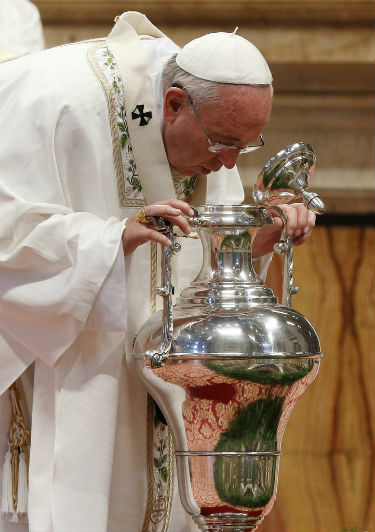 VATICAN CITY (CNS) — Priestly ministry is hard, sometimes lonely or dangerous work serving the neediest with an open, vulnerable heart, Pope Francis told the world’s priests. 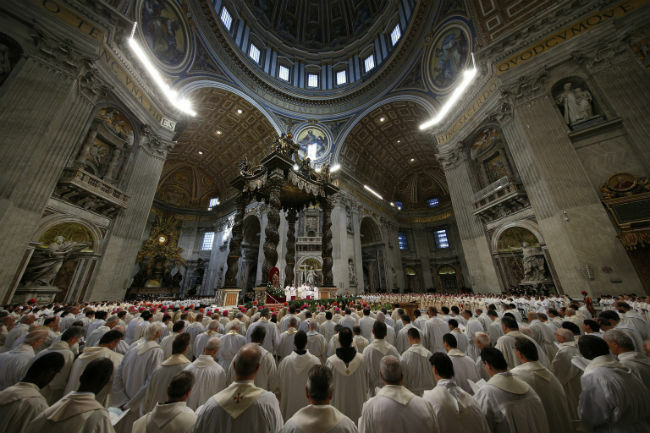 But priests need to learn how to draw strength from their flock and their love for God, and not look for rest or retreat in “worldly pursuits,” hiding in their office or riding in cars “with tinted windows,” he said April 2 during the chrism Mass in St. Peter’s Basilica. Priests can find renewal when they do not try to be “supermen,” but instead put their trust in God to embrace them and carry them through, he said. If a priest is doing his job right — if his heart is open and he experiences with compassion all the troubles, fears and joys of his people, then “so many emotions, so much affection exhaust the heart of a pastor,” he said. Sharing in people’s suffering makes the heart feel “broken into a thousand little pieces” and given away so much it almost seems “eaten up by the people,” he said, drawing a parallel with what is said at the Last Supper: take this all of you, eat this, drink this. 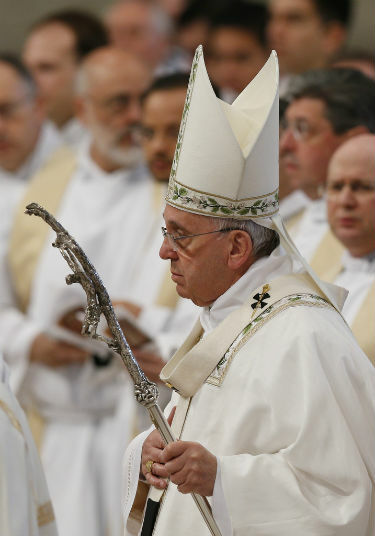 While he had warned members of the Roman Curia in December of “15 spiritual diseases” they should avoid, in his Holy Thursday homily for priests Pope Francis outlined three kinds of “weariness” they should watch out for: exhaustion from being with the people; fatigue from fighting “the devil and his minions;” and ennui from becoming selfish and worldly. But that gaze “has nothing to do with those who smell of expensive cologne and look at you from afar and from on high,” he said in a homily delivered in Italian. If Jesus is there shepherding with the priest, “we cannot be shepherds whose faces are bitter, grouchy or, even worse, bored,” because being with the flock with the smile of a father reflects a weariness that brings joy, he said. When talking about the third form of weariness, the “weariness of ourselves,” the pope emphasized that it was his final point “so that you won’t be too worn out by this homily,” which at 21 minutes, was longer than the norm for Pope Francis. It was a paradox of giving up everything for the priesthood yet yearning for the fleshpots of Egypt — “a weariness I like to call ‘flirting with spiritual worldliness,'” he said. The weariness that comes from following Christ and being human “is precious in the eyes of Jesus who embraces us and lifts us up,” he said. Later in the day, the pope was scheduled to celebrate the Holy Thursday Mass of the Lord’s Supper at a Rome prison and wash the feet of six male and six female inmates.